The 2018 Clip Flashlight attempts to improve a classic; I think they’ve succeeded. Received from Sierra Designs for testing and review. The Clip Flashlight is a 2-pole, non-free standing design. The fly is a bit more tricky. For the fly, you start by clipping it to the tent at the foot end of the tent. These clips are color coded to make sure you have the fly on the right way. From this point, there are no more clips on the fly. 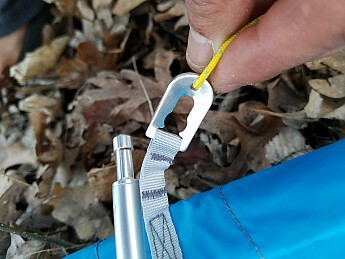 You attach the sides of the fly by shock cord to the stake out points on the sides of the tent. 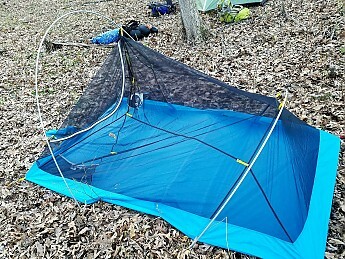 In other words, the side stake out points use one stake for both the tent and the fly. You then pull the vestibule taut and stake it out. This will leave a bit of sag in the fly since it is weakly attached to the tent. For this reason, there is one more stake centered at the foot end of the fly to pull and balance out the system. Once you do this and draw the static straps and cords until they are tight, you will create a firm fly that is ready to shed the elements. The cinch cords use a plastic molded piece to produce friction. They are easy to use and have held their position in average conditions. The diameter is slightly smaller than those from tents a decade or so ago. The tent still seems to maintain its integrity. I haven’t yet tested it in really windy conditions so I’m not quite sure what the threshold is for how much of a beating the lighter gauge poles can take. 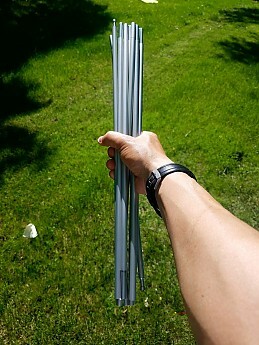 The poles are straight without angled fittings. This keeps their volume to a minimum for packability. Another nifty change in the tent is the pole inserts. They are low-tech pieces of stamped out metal. No broken clips to worry about, no cracked plastic—just durable, long lasting rectangles of aluminum. They are a breeze to use and mate quite well with the pole ends. I really liked this feature. They are the same weight as most standard stakes but they resist twisting around in loose soil or sand. This change keeps the stakes pointing the correct direction which reduces slippage of the shock cord that you thread with the stake. A small but intelligent adjustment. The fly has some velcro straps that attach to the poles for added stability. So far, they have not separated from the fly as they do in many newer models. 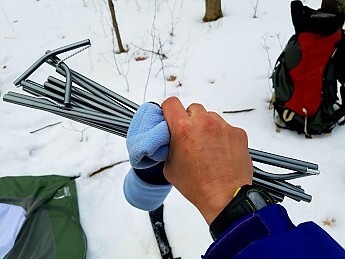 After all is said and done, you need 9 stakes to pitch the tent (unless you make your own on-site). Even after using 9 stakes, there are still two additional (optional) stake points on the base of the fly as well as 2 (optional) guy out points on the fly. If I ever feel the necessity to use these additional points, I just carve a few stakes out of wood from surrounding branches. Once you get the hang of setting up the tent, it goes quite quickly. I’d say that I can get the whole thing up in around 3 minutes. The fly does an exemplary job at keeping out the elements. It’s a pretty durable coated fabric. Some of the newer fabrics are so thin that they are translucent. The Flashlight opted for a slightly more heavy duty fabric. I don’t have puncture or tear worries while pitching and taking down this tent. All seams are taped. 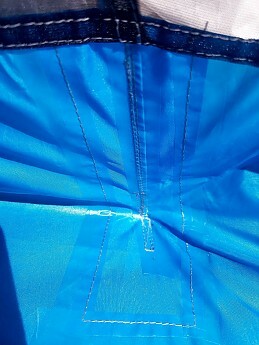 The floor of the tent has one taped seam that runs crosswise. My only issue with the design is that when the door is open, it exposes a good deal of the interior of the tent from above. The exposure can pose a challenge if pitching/entering/exiting in the rain or other precipitation. 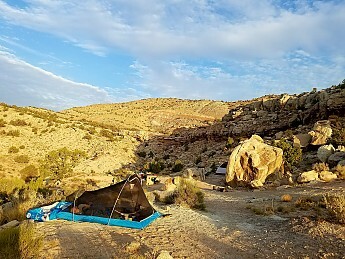 Some tents allow you to fast pitch the fly first and then connect the tent under the fly during inclement weather. This is not possible with this model. I fell victim to the space differential between the fly and tent. I accidentally left the fly draped open over the top of the tent while on a hike. It started to rain. By the time I got back to camp, the tent took in lots of water. I can tell you that, from all the water that pooled in the tent, the floor of the tent is impermeable. I can’t blame the tent for my blunder however. The tent itself if entirely mesh with the exception of the floor. 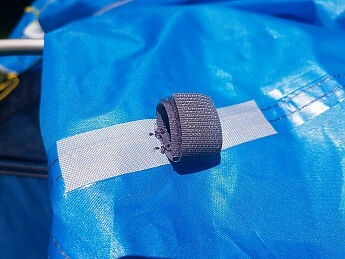 This feature allows the tent to vent fairly well. Like any tent, the condensation is a variable dependent upon conditions, number of occupants, temperature, etc. I would say that the tent does a good job venting. You can always open the door part way for additional ventilation and still stay dry. If you remove the fly, you can sleep in nearly open air. There is no vent on the fly, however, you can partially roll up the fly from the bottom or you can crack the top by unzipping it from the top down. The 2018 Flashlight model has increased the livable space and headroom in the tent while at the same time, shaving a few ounces. There is just enough headroom to sit up and not have screen pressing against your knoggin. The tent sleeps two people comfortably. This seems to be the exception in lighter weight tents these days. 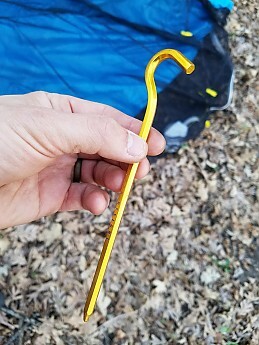 Most 2P tents are actually sardine cans if they are sub 3.5 lbs (1.6 kg); not the Clip Flashlight. I can fit two standard tapered mattresses in with room to spare.In fact, I can fit my Klymit Static V Luxe mattress with a standard tapered mattress in the tent. The storage pockets are a large capacity. As you can see in the pic, they are double the size of my 11.5 size (42) foot. The vestibule fits two large size packs in it. It really extends quite a good distance out from the tent. Again, this model does an excellent job with the space-to-weight ratio. The packability of this Clip Flashlight is superb. When it came in the mail, I thought there was a mistake; the box was so small. I took the tent out and was very impressed. It’s just barely larger than my shoe. I’ll just let the picture speak for itself. There will be room to spare in your pack if you take the Clip Flashlight with you. 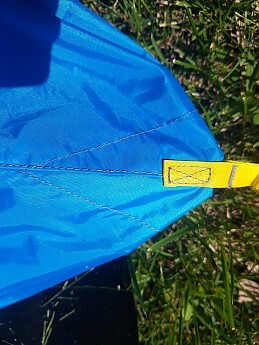 The sack for the tent is a top loader as opposed to an end. It rolls up and sets in the sack easily. There are two cinch straps to decrease the volume a bit more. The tent is fairly simple to set up. The fly adjusts with ease as you pull down the cinch straps. The D shaped door does a good job opening and closing even when navigating the sharp corner turn. Because the fly extends out a good distance, you do have to stretch to zip the fly door all the way down when closing up shop for the night. The poles collapse with no problems and the clips are simple to pop on. When packing up, shaking out the debris in the tent is not a problem. I thought it would be since it’s not free standing, but if you just remove all of the stakes and grab the tent by the back pole, you can lift the whole thing up and shake it out. In this model, there is an option where you can use trekking poles to prop up the door on the fly to create a sun awning of sorts. I suppose it’s a fine option but I personally haven’t used it. You can also roll the door fly up and clip it. This allows for nice ventilation. One feature that I am impressed with is the low-tech lantern that comes with the tent. It’s a small fabric lamp. You put your headlamp into it and cinch it (yes, you must provide the light source). The lamp creates a nice white glow throughout the tent. It produces whatever number of lumens that your headlamp setting does. This means that it is usually brighter than Mountain Glo or other LED string options. If you have a red option on your headlamp, your tent can become a mini "red lights district"—ooh la la. If you have a strobe on your headlamp you can make your own discotech! You also don’t have to worry about the extra weight of a battery pack (as required with MtnGlo). The drawback is that you’ll drain your headlamp at an accelerated rate so it may be relative in the end. The lamp has an adjustable hang string to allow you to lengthen or shorten it. This way you can use the lamp in other tents or between trees at camp. The excess string does dangle if not wrapped up. I was woken up in the middle of the night by it sliding across my face. For a minute, I thought I was being attacked by a pygmy snake. Thank goodness it was just the lamp string. The tent has a single front door. I usually like side entrances (especially double side entrances) however, the Clip Flashlight’s extra wide interior space allows each user to successfully enter/exit the tent without accosting their roommate. There are also 2 side guyout lines to provide additional stability if needed. Seams are taped. The fly fabric is durable and thicker than many current lightweight models. All stress joints are reinforced well. 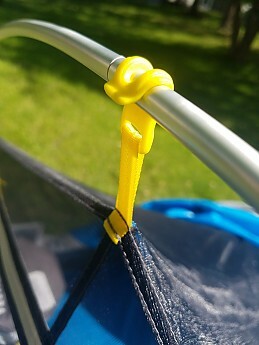 The corner fly to tent clips are pretty light duty. Although they are a lighter gauge, I've never had any issues with them. The mesh is standard no-see-um. The poles are also a slightly smaller diameter than those of tents that I've used in the past. These lighter gauge materials are one of the ways that the tent has been able to shed some weight. Time will tell if these materials will perform well. Used in United States Midwest Region during spring and summer. Two summer camp outs with overnight temps in the 60’s and low 70’s with high humidity. On the latter camp out, there was a short bout of rain that lasted for an hour or so. The tent did a very nice job staying dry). I don't have much to complain about. The 2018 Clip Flashlight has made improvements that are meaningful and responsive to trail feedback. The result is an improved model that increased living and storage space, decreased pack size, and simplifies set up. It also includes a couple of clever features. If you do not require a freestanding tent, this might be a model worth looking into, especially considering the retail price relative to the competition. Update 9/06/18: I brought the tent out on a western tour of the US. Used it over a week in many conditions including desert, alpine, and forest in 5 different states. Temps ranged from the low 50's to the high 80's at night. We pitched it with the fly on in the mountains, 1/2 way open in the plains, and the fly off in the desert. Big winds in the Big Horns didn't harm it. It performed well and gave my son and I a reliable and comfortable week. The tent is living up to the original review and I have no additional complaints. Setup: The Clip Flashlight is a fairly easy tent to set up. It’s a two-arched pole design. First, stake down the base of the tent. Then place the pole ends into the grommets at the base of the tent and then use the clips to fasten the the tent to the poles. 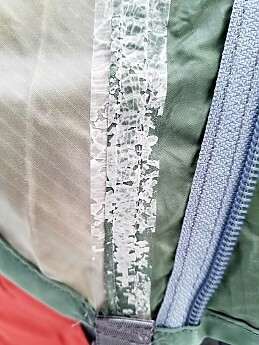 The signature “clips” that create the tent’s namesake are four twistable clips that lock the pole into the clip so there is no chance of the pole sliding around. 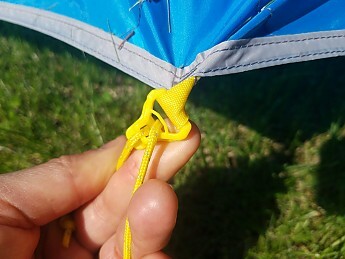 I find that this feature is nonessential since I’ve used a number of other similar two-poled tents without the clips and I’ve never had any problems with the pole sliding out of place. The tent pitches fairly taut, especially when guyed out properly. I pitched the tent in snow during my last outing and it did well. I suspected there would be a good amount of sag by morning, but the tent maintained its form. The fly is clipped onto the tent in the corners. 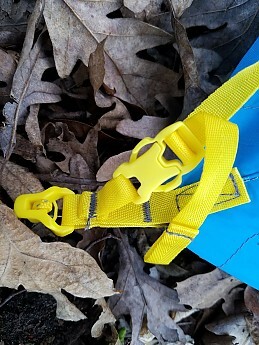 Each clip has an adjustable strap to pull the fly more taut. There are a few other points on the fly that can be staked out. 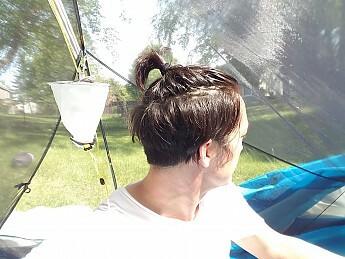 The entry is a single entry at the head of the tent. It’s a rounded zip. The first angle is a bit too sharp and so the zipper is a bit difficult to maneuver in that corner. It takes a bit of finessing to get it around that first turn. The entry zipper on the fly is diagonally cut. I found that the straight line keeps the zipping motion very fluid. I like the ease of it. 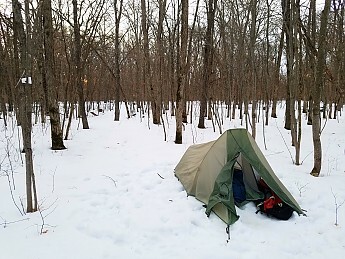 Weather Resistance: Pitching in snow seems to be a decent way to test out the ability of a tent to keep out moisture. The Flashlight was dry as a bone at morning. The fly guards the topside pretty well as well. I’ve never had any water get into the tent unless I dragged it in myself. The base of the entry door extends slightly further than the opening of the fly so be careful when entering in the rain; some may get in. One drawback of this older Clip Flashlight model is that the seam tape deteriorates after several years. It becomes a flakey mess. 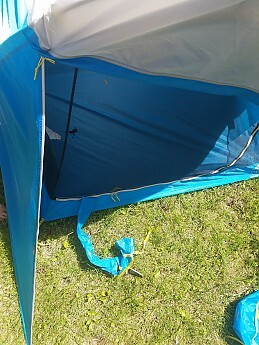 It’s virtually impossible to remove the flaking so I resorted to seam sealing the exterior of the tent and fly. This has done the trick. It is once again water-tight. I’ve had the exact same problem with other Sierra tents that I’ve owned from the same production period. The fact that the tape deteriorates isn’t a make or break issue for me. As long as the fabric keeps its impermeability, the seams can always be re-sealed with minimal effort. Ventilation: The upper of the tent is nearly all thin white breathable fabric so it vents quite well. There are no vents in the fly so to speak so, if weather permits, you can unzip the top of the door zipper for some additional venting. Even in moist conditions and winter conditions where condensation tends to be problematic, I found the Clip Flashlight to have less condensation than most tents that I’ve owned. 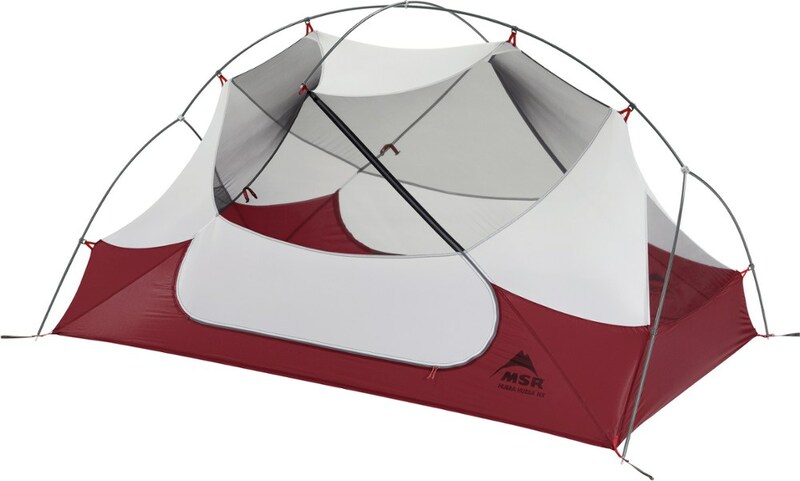 Room and Storage: There is enough room for two persons in this tent, however, there is not room to spare. As long as you are positioned correctly, you can sit up in the tent. The ceiling tapers quickly toward the foot area so there’s not much room for maneuverability. The tent is somewhat of a cross between a bivy and a traditional tent. 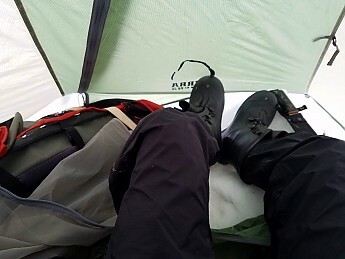 Because of the taper toward the foot of the tent, avoid bunking with those who have restless leg syndrome or you’ll know they are there throughout the night. Two tapered air mattresses fit fine but two full size rectangle air mats will overlap slightly at the feet. From the exterior, it would seem that the tent might have a little more height but it angles downward quickly from the high pole. I am 5'11" and I fit lengthwise just fine. There are two interior pockets that are approximately 8" x 5". One great feature of the tent is the size of the vestibule. The vestibule will actually fit two packs and shoes. From the picture, you can see the size. 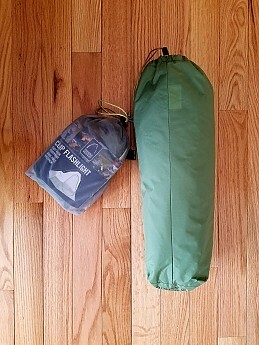 Packability: The tent packs down fairly well (roughly 7x 15"). Since there are some kinks in the poles, they don’t fold down quite as nicely as straight poles. Construction and Durability: The fabric used in the Flashlight is durable nylon. Stitching is reinforced at the seams. The poles are DAC aluminum with shock cords. All of these result in a tent that lasts for years. 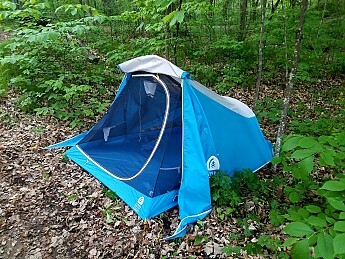 For only a two-pole non-freestanding design, I think the nearly 4lb weight seems like it could have been a bit less, especially considering the lack of “livable” space within the tent. 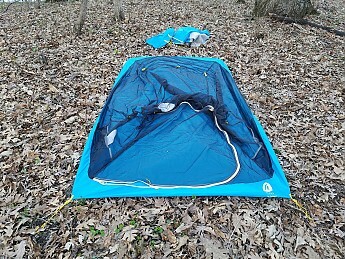 Conditions: I bought the original, older tent used but like new and I used it for two seasons (fall/winter). I ended up selling the tent because I prefer a freestanding design. 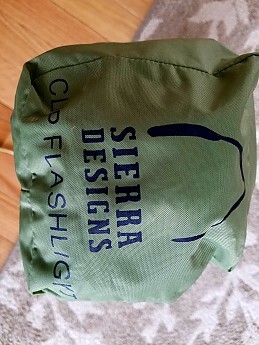 A second, updated Clip Flashlight 2 (2018 model) was provided to me from Sierra Designs for review. Nice review, Jesse! Thanks for taking the time to share it. These great old tents. Have you seen the updated version? Yes, I've seen the new ones. I put a bid on one last year but didn't win. I'm interested in trying out the newer model. 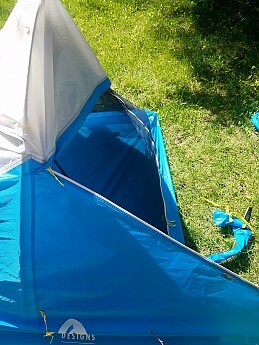 @travel-r, I hope you'll share your experience with this tent in a review, once you've had plenty of time to use it. Have fun! Alicia I'll try but ..I don't think is humanly possible to write a better tent review than Jesse, one of the best tent reviews ever! Travel-r. I'm glad the review was useful. Please do write a review since I love to hear other perspectives. They are especially useful from reviewers who live in different climates. Performance is often relative to the environment. Thanks for the kind words! 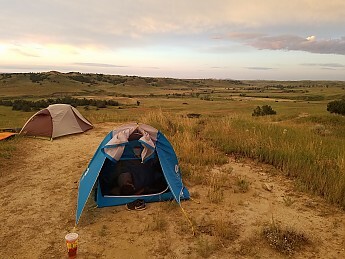 Yes, Jesse does write excellent, very thorough tent reviews (thank you, Jesse!). But, as he said, it is always helpful to have reviews from other users, whether your experiences are similar or different. Just got my new Flashlight Clip 2 today, very curious and very excited at the same time. This summer it will be my home away from home for six weeks long camping in the Med, plenty of time to test it thoroughly. Btw Jesse you mentioned the seams of the older model deteriorating over time, well my old Flashlight even after some 37 years of trusted service still no visible tear and wear due to old age, still have the original leaflet though with ‘Lifetime Warranty’ on it, looks like the old tent will outlive me for sure. 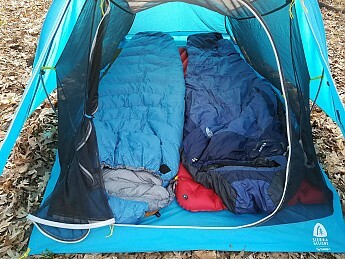 I got the 2018 version because of the full mesh and the roomy interior, the old Flashlight (1982) performs great when nights are chilly and damp by keeping the inner tent dry and comfy but when it gets >+80F and the sun is shining feels like an oven, also for 2 adults felt very cramped, I see it more like a big bivvy for one person rather than a two persons tent. Some reviews claim the 2018 Flashlight Clip 2 didn’t feel stable enough during windy and stormy weather, what was your experience? To answer the question about the wind, we camped on one high plateau in the Bighorns one night and the wind was very gusty. It' held up fine. I've never had it in anything above 30 mph gusts so I can't speak to that. Great tent for the most part. Great tent. Has held up since purchase in '99 without any need to reseal seams, minimal leakage and I use a space blanket as the footprint. Light and small and easy to set up. Got this way back in 1997 or so. It's been a very nice one man backpacking tent. Back in the day it was one of the lightest you could get. I still use it for my solo excursions. It's held up well to moderate use, mainly on the west coast. The footprint has deteriorated to a sticky mess, that will get replaced this spring. The fly is starting to feel a little like the foot print, but only slightly tacky instead of totally gummy like the footprint. I've squeeze a buddy in on several trips when we were going light. Smallish vestibule, but still totally practical and usable. The new ones seem to have some nice tweaks that mine doesn't. Overall I must say that I love this tent. I first got it about 3.5 years ago when I was getting ready to do a cross country road trip. 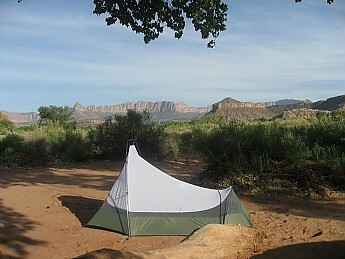 The attached picture is our home set up outside of Zion National Park. We've used this tent for both backpacking and car camping fairly often and have had no issues with rips and/or tears, leaking, or excessive condensation. The tent is both light enough for backpacking and roomy enough (for a married couple) for car camping. 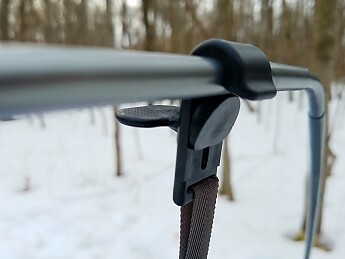 It is also easy to set up and the poles attach to the tent via clips instead of sleeves I prefer clips as I think they are easier to use then threading the sleeves, so this was a big selling point for me. Another reason I first looked at this tent is because it is the tent my mom use to take our family backpacking with when we were children. 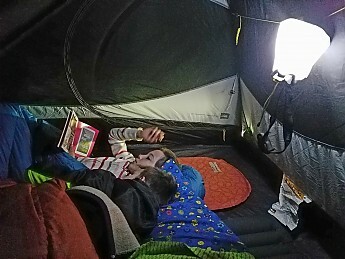 We would sleep all 4 of us in this tent (3 very short kids and one 5'-1" mom). That was approximately 20 years ago and my mom is still using the same Clip Flashlight to climb Mount Whitney today. It's a durable tent with great longevity. My only complaint would be the stakes that came with were not very strong (we have bent almost all of the original stakes) and they had to be replaced with MSR Groundhog stakes (because I think they are better and more durable as well). I have had this tent set up in very windy camps (probably 40-50 mph +/-), very rainy camps (Hoh Rainforest), and beautiful dry desert camps, and it has performed beyond my expectations in all circumstances. Sweet tent for the price, pretty light for a double-walled tent. I'm used to a single wall minimalist, it's nice to have the option of no fly so I can see the stars or critters creeping up @ night. Also the gear pockets/loops and vestibule are handy. definitely compatible for two people, I was more than comfy with two...obviously fit for a king with only one person inside. Great product for the price. The best tent I have ever owned at this weight. I have had mine for 5 years with no problems whatever. Spent two nights in the Grand Canyon with wind gusting 50-60 mph all night without a problem. Have used the tent solo and with my wife. Room is limited with two people but I'm backpacking not spending a night at the Hilton. 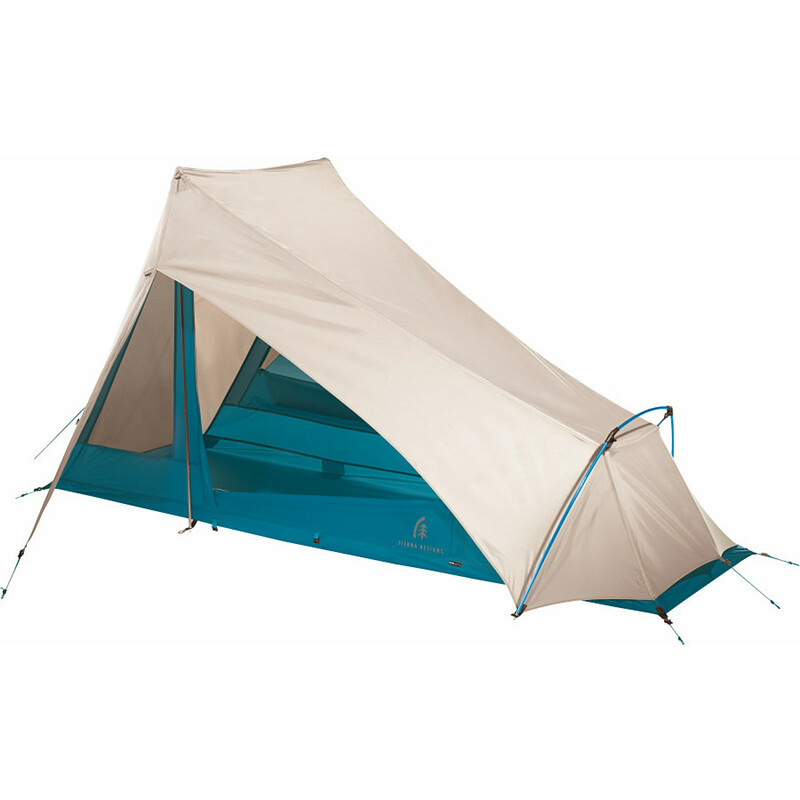 Show me a tent at this price and weight that offers more and I'll buy it. Pros: Lightweight, ventilation is excellent, watertight, good room to weight ratio. Cons: I do not like the stakes provided with tent, I've swapped mine for SD "Y" stakes. I have used this little puppy for seven years now and I must say it has held up to all my use. I'm pretty rough on gear and so far, everything has held its ground. So superlight and small, I have taken it on overnighters and slipped it in my backpack with my books. On the flip side, I used it for a month trip I took out west in January (don't let anyone tell you that you can't convert a 3-season into a warm environment). With a little fleece on the bottom, you're good to go. OK, the cons...actually, only one and a half, it's not free-standing and its smalllll. HOWEVER, it's not the tent's fault b/c the small non-freestanding is the design...so, really, it's my fault. So, now I have "upgraded" to a SD Alpha CD just to have more room for the dog and the lady, but still holding on to the Flashlight for those solos. It is by far the best backpacking tent ever made. This tent is great!! It's light and it's easy to set up. I like it because it's a lot roomier than most solo tents for only a little more weight. You can sit up and change comfortably in the tent. For those saying that it's not sturdy in high winds, learn to stake out a tent. I took it to Tennesse in the spring and set it up on one of the highest ridges in the area. Unknown to us untill the next morning, a tornado touched down 15 miles away. The wind blew and the rain came down, but I stayed dry and the tent didn't move. Just make sure you use the guylines. 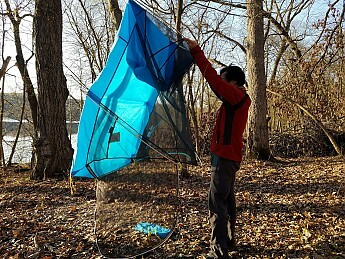 I had posted earlier on this tent with a promise of an update on how I fared with the Warranty and Repair people at SD, after the main pole snapped in high winds the first time I set it up, and went through the rainfly. I was told there was a two-week turn-around time, after they received the shipment. Well, six weeks later I still had not got my pole and fly back and it took 4-5 days of constant calling to motivate them to ship it back. Everyone I spoke with was apologetic and professional, but that's too long a turnaround. I missed a couple of good trips because this was my only tent. I like the tent generally, and will be using it a lot more now that it's repaired. This non-freestanding tent is a great 2-person, 3-season backpacker that is not only super lightweight, but packable and inexpensive as well. 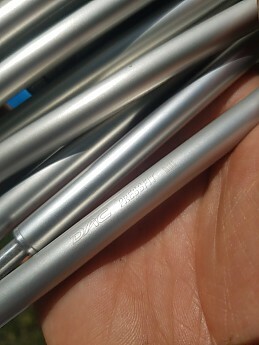 New for '00, you'll find the Easton DAC Featherlite poles (which sheds 15 percent of the original pole weight) and new clips that supposedly make the tent a great deal stronger. 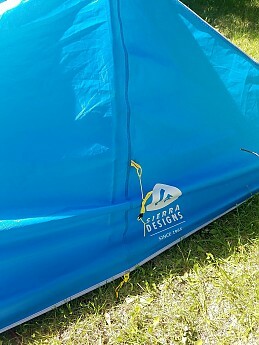 Not to discourage anyone from buying this tent (because it is really a GREAT tent), but in the short time they've been around, i've seen two different DAC Featherlite poles fail under heavy winds (60+ mph, properly staked, with guidelines). Appearently Easton didn't give its usual 110% on the DACs. If the tent is kept in winds less than or around 50 mph, the tent's weight and features will only be beneficial. I placed a comment on the jacket side for Solstice vs. TNF. That should give you some idea of where I am coming from. . . . I let Backpacker Magazine do the majority of the research before I bought my tent. They were right-on. My 2.5yr old tent is the bomb! I camped at Boulderfield at the base of Long's Peak in June and froze my 'nards off in the -15 degree temps, but the tent stood up to the 50mph gusts with nary a prob. I have used this sucker at Long's Peak, Mt. Evans trail ascent, Sam's throne climbing area in Arkansas (where everyone is your cousin) and all over SW Missouri. My one complaint is that this tent is not freestanding. I don't camp much in parking lots, though, so this has not been much of a problem for me. I SeamSeal-ed it upon purchase and applied one treatment of Tectron fabric seal. No leaks. Period. 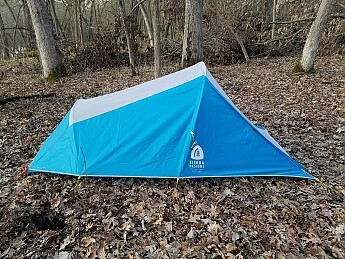 For a true 3.5 season tent that won't break your back or wallet, buy this tent and never regret it. Why buy a $900 Bibler intended for use at 24,000 feet in the Himalayas when you only hang in the contiguous US (under 14,500 ft.)????? I guess so everyone will know how rugged and experienced a mountain man you are (so everyone will know how little you know about your gear, how foolish you are when it comes to money, and what a wanna'be you are). Great little tent that does what I bought it for. 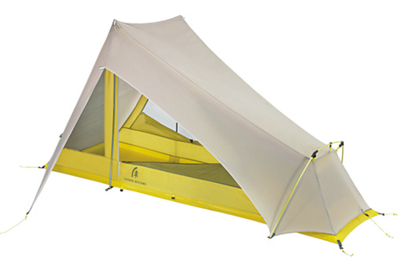 Ultra lightweight shelter best suited for solo use, but fits two in a pinch. I've had this for four years now and I still cannot find a lighter two-person tent. VERY cramped for two -- all seem acceptable when you consider the low poundage for a decent tent. Newer versions are said to be even better. Gets me through the three seasons here in NE and out West just fine. I used this tent once in Big Sur, California. I sealed the seams with Seam Grip, and bought the footprint as well. It started raining and continued to come down just after we fell asleep. When I woke up about five in the morning, everything was completely soaked. The rain was coming through the rain fly like it would through a screen. The only things we that were dry were the things we had in our backpack that was covered with trash bags. It goes without saying that I was disappointed with the tent, and would not recomend this tent or brand! Ease of Setup: With practice, 5 minutes. 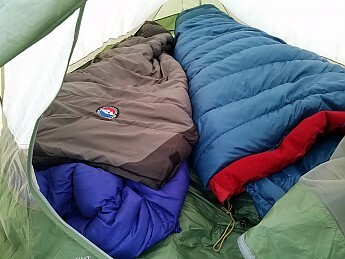 Verdict: find me another TENT (not bivouac shelter!) under 4 lbs and I'll seriously consider buying it. I've had this tent for several years. It's been to Alaska, Texas, Pennsylvania, the Smokies, all over in the western US. Never a problem. YES, it's tight with 2 good sized people. Waddya want for just over 3 lbs? I've waited out downpours in this thing that kept me up all night checking for leaks; found none (seam seal it and use a proper groundcloth slightly smaller than the bottom). Great ventilation in the desert. 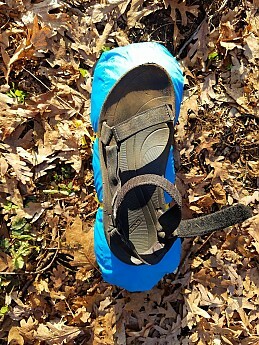 Used it for cross-country ski backpacking in sub-zero temps in deep snow. Learn how to set it up in snow and it works great for 4 seasons. Best tent for my purposes. Nothing on the market even close. P.S. - Should they be allowed to put the work "lite/light" on a tent that weighs over 6 lbs? 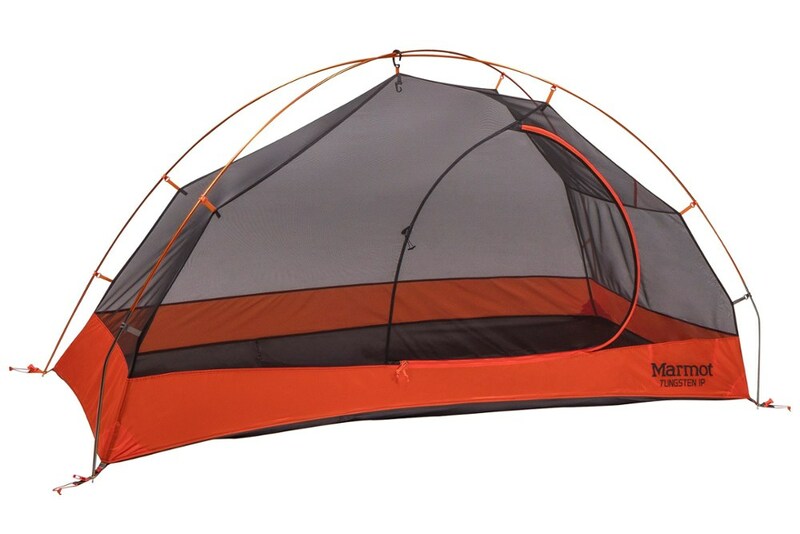 This is the best backpacking tent made. It really turned heads when I bought it (in 1991) and it still does. It is incredibly easy to set up, it's usually the first tent up in camp. Also, while it is not freestading, two extra stakes and 15 seconds is well worth the weight. I don't understand why anyone would buy another backpacking tent. If you do buy an old one, try to buy a Clip Flashlight, I almost bought a sleeve flashlight 1990 model I think, and it is slower to set up, and the vestibule is really tiny. The newer designs have improved the one that I have. Bought this tent used and sold it as soon as possible. Bought this tent used and sold it as soon as possible. The basic problem is that the tent setup is way too time consuming for this type of tent, in this price range. Get a freestander. Not worth the money or the time. 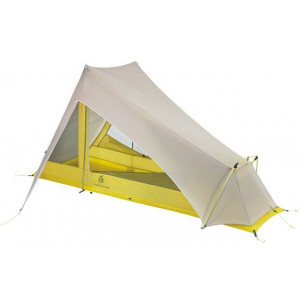 I bought this tent with weight as my first consideration: It is one of the lightest (at that price). The drawbacks are: Not too much room (you can't really sit up in it even when alone. If you pitch it up every night and take it down again the nexxt morning, setup becomes rather bothersome. I prefer domes for the possibility of picking them up and just moving them to a better place which you ususally find just after set up. 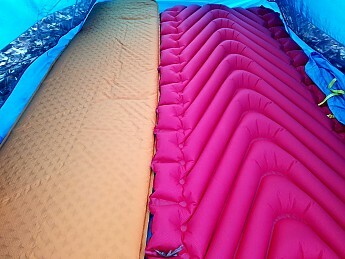 it ventilates very well, which makes a good sleeping bag necessary when you camp in cold weather. 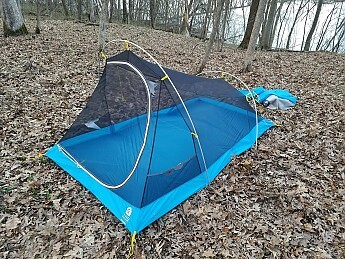 Definitely recommended for light camping in warm zones were you want a shelter but not too much more. Small vestible, it has small storage space and it does not come down far enough all around the tent. When it rains real hard water runs off the rain fly onto the lower main body of the tent also causes water run-off to splash mud on the body of the tent. If the tent is not staked out as taut as you can get it the side walls of the tent sag by the next morning. 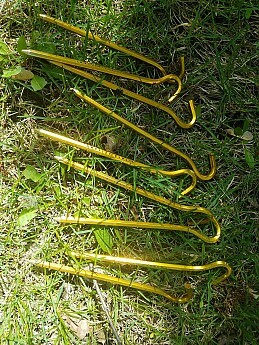 Cheap stakes, a person will have to buy new ones after first trip because the ones that come with tent will have bent. The tent is light. 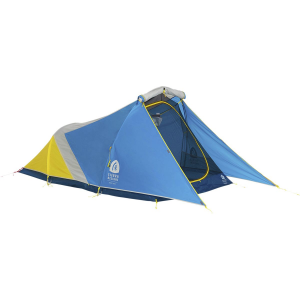 Great backpacking tent, packs small. It is very wind stable even for a tall hoop style. Can actually fit two people in it. 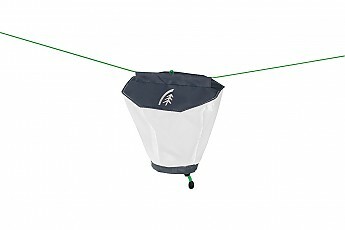 Light weight, packs small, 2 people can sleep in it, wind stable, cool hanger for a candle lantern. Fly provides little storage space, also the fly doesn't leak but it does not come down far enough to keep water from dripping on the corner of the tents and hard rain from splashing mud up on the body of the tent. 2 poeple can hardly move in this tent. A very good tent for 3-season travel. One to two people can fit but two fills it up. 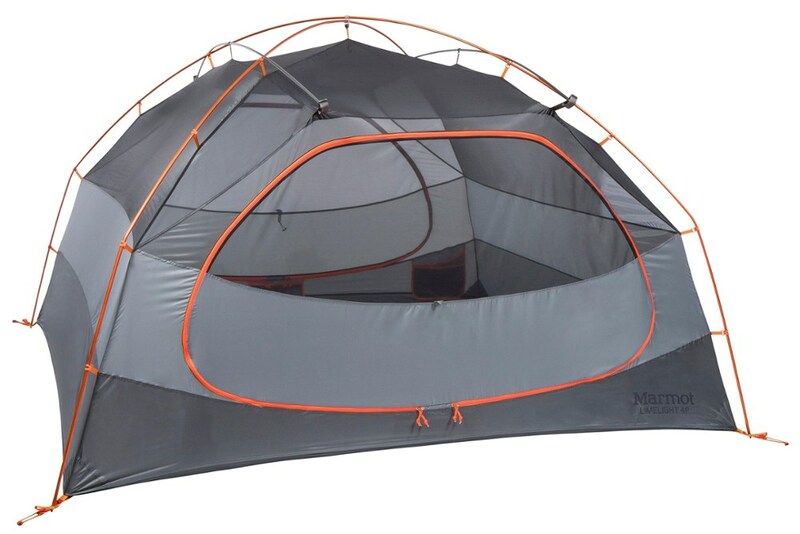 A remarkable tent for the price. Used on 35-consecutive day bike tour of Japan's northern island Hokkaido during the summer months; I got well more then my money's worth. 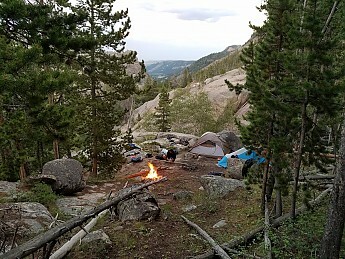 The tent provided me with comfortable, dry housing for over a month in conditions ranging from hot dry temps to cold, wet, windy mountain tops. 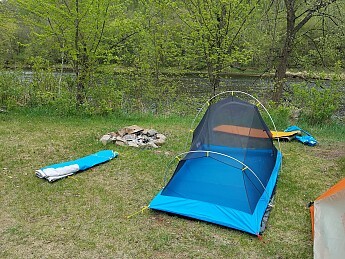 Designed to accomodate two people, I found the tent to be perfect size for one person+gear. The trick to keeping dry in the rain is to setup the tent body slightly slack while applying the rainfly over it as tightly as possible. 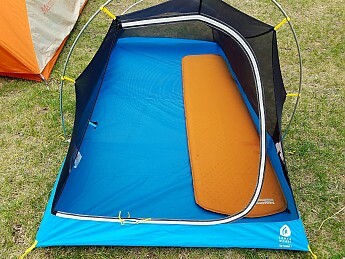 The materials are strong, poles can handle average to tougher winds which makes this a perfect backpacker/bike tourist's tent in moderate weather conditions. I wouldn't push your luck in high wind (+60mph). Light, simple, great, but only for solo use. Too cramped I think for even very cozy two-some unless they're both under 12-years-old. Very small vestibule, barely large enough for one pack. Even though it's the lightest, you need one per hiker, so if you're with a partner, carry a true two-man tent. Even if it's over 6 lbs., it still comes out to less weight per person!